First things first: THANK YOU for your rather overwhelming reception of the Adult Tomten. I've had such a nice week reading and responding to your comments. Many knitters have started talk of making more, which excites me to no end. Please keep them coming! In light of recent heat waves (hello July! ), I've been working a little lighter. 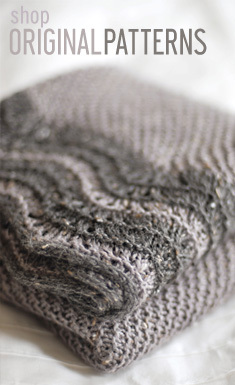 Simple projects with less blanket-ous qualities than my usual sweater line-up. Sure there are always sweaters on the needles, but there's a higher concentration of The Little Things. The best thing about finishing my BSJ (aside from wanting to immediately start another), was realizing that I had a huge hank of handspun 2-ply leftover from my HelloYarn haul. Since knitting the BSJ was all garter all the time, I thought I'd just zone out on something simple and watch the yarn work its handspun, handdyed magic, this time in stockinette. And what magic it is! 16" circular needles really make me happy. A simple hat. I'm happy just watching the colors change and that unique handspun fabric grow. And speaking of handspun, behind the scenes I've been quietly spinning away on my little drop spindle, trolling the internet and the library for information, exploiting spinner friends as resources, and teaching myself about this wonderful art. There's quite a learning curve, but its relaxing and mindless - think stockinette in the round - and is a nice way to take the edge off of your day. I like the idea that drop spindles are one of the earliest pieces of technology from some of the earliest civilizations. 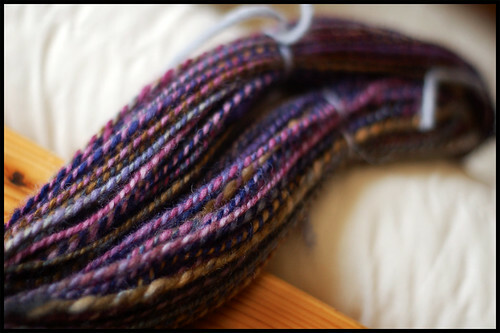 *Fiber pictured above is hand-dyed roving from Adrian. Weekend knitting is just around the corner. Tally Ho! The handspun is gorgous! Makes me want to get my spindle out again...almost. :-) I've been lurking at your site for a while. I really like it. Keep up the great work! The handspun is stunning, I wish I could spin like that! I also really like the hat, the colours are gorgeous! Your spinning looks wonderful - I'd say you're catching on quite naturally. Your spinning is wonderful. I've only picked up my spindle twice and am still learning how to avoid slubs. And you are plying! Gorgeous stuff. Ok, I am freaking out you can do that on your drop spindle! Dude, please tell me that you can't cook or make martinis or drive or something because there is talent oozing out of your pores! I had to come out of lurking to comment on your handspun. New spinning hands? Um - that's pretty fabulous stuff. Have you checked out the "Teach Yourself Visually Handspinning" book yet? I just got it this week, and I really like it -- it's got good info on both drop spindle and wheel spinning. Wow, you're doing great with the spinning! It seems very nice and even -- great job! But be careful -- it's terribly addictive! Wow you did that with a drop spindle? Its gorgeous! Stunning handspun, of course, but would we expect anything less from you? No, not really. Lovely handspun! And the hat looks like such fun. Your sense of color is incredible and completely inspiring. And now (as usual with your projects) I want to learn how to spin too! How do you DO that? My handspun just ends up looking muddy when I try for interesting color combos. Yours is gorgeous! Gorgeous, I say! this is not yet the new one, right?!? Oh, you will SO end up getting a wheel! Had to tell you how much I enjoyed reading about your Tomten, which I was going to make until I saw Cully's jacket in one of the EZ books. Now I can't decide. Back to your spindle spun yarn...it's beyond fantastic! Loved the Tomten post, thanks for the insight into how you made another knitted masterpiece. I just started spinning with a drop spindle too - but dude, you are too much! Just beautiful. argh i cannot believe you. tried this many years ago. and i could never figure it out. i could dye wool with plants from nature but this freaked me out even though i had roving from a sheep called koh-i-noor. Wow. You are an amazing handspinner for a beginner. I can't even get handspun that looks like that. Stunning as always. I am amazed and the color and even-ness of the spinning. Your spinning is great - especially for a beginner! Did you join Adrian's fiber club? Heaven help us if you start dyeing, with your eye for color, I may as well sign my paycheck over to you! Y'know, BT, your photography is so stunning, that even patterns which I have never had any desire to knit look like works of art. You are possibly the best knitter and/or photographer in the universe! very nice job for a new spinner! i have a spindle, but i've never used it. i need to dig it back out and give it a shot. i usually spin on a castle-type spinning wheel. and i adore working with handspun. it has a completely different feel in the hands than commercial yarn. Top notch spinning work Jared. I'm amazed at how consistent and nicely spun your yarn is, but then again, I wouldn't expect anything less from the 'Tweed. Gorgeous spinning! So when are you planning to get a wheel? Hah! Your handspun looks amazing! I can't believe you're a novice. You must have been a spinner in a former life. That is absolutely gorgeous spinning! I'm on vacation and your photos make me wish I'd brought my spindle! Yep, that drop spindle business. I saw it in 'action' for the first time at a craft show recently. All I could think was Good Gourd the patience that's required. But I guess it could also force the mind into quiet contemplation. Oh that HelloYarn is gorgeous. Wow! 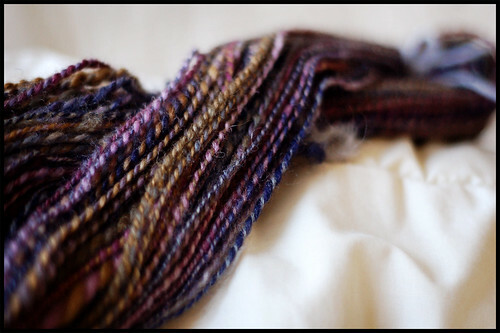 your handspun looks beautiful. Are you sure you are only a beginner? Love the lovely pink-tinged colours of the brown handspun. Crap. I have never, ever been remotely interested in spinning.....until now. How is it that everyone else can make wonderful creations with their spindles and I can't even get something that remotely resembles yarn? Look at that handspun! Looks great. Proof that you are in fact one of the most talented people I know. Do you ever cease producing drool-inducing eye candy? 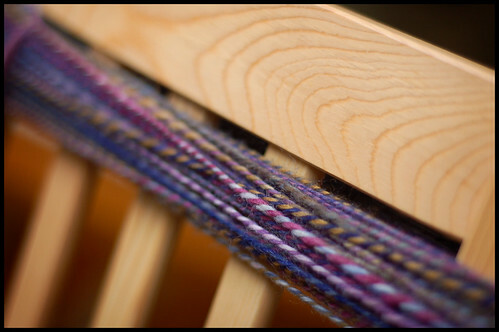 That yarn you've just spun...wow, absolutely beautiful! 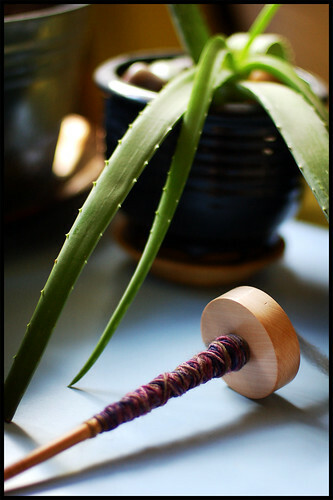 I just purchased a drop spindle and some roving. I'm going to give it a shot as well. Yours looks amazing! seeing your first attempts at spinning has been so encouraging... yours looks so beautiful that i'm definitely going to have to give it a try sometime soon. 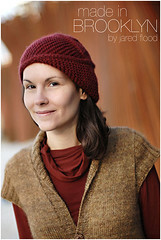 That is some truly gorgeous yarn, and I love the jacket you just finished. I've never been a fan of garter stitch, but your design is fantastic. 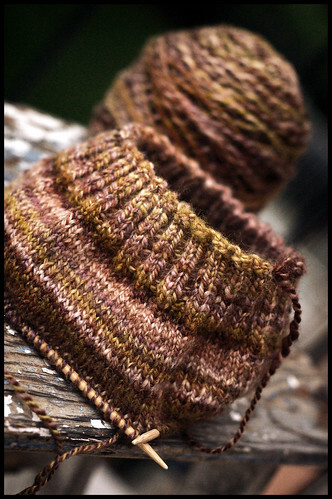 love the colors in the yarn you're using for the hat. they are gorgeous! How long (in approximate hours) did it take you to be able to spin such an even yarn? I've been practicing but I'm beginning to lose all hope of producing a usable yarn. Wow! Even your newbie handspun is beautiful! You've definitely got a gift for the fiber arts! I'm excited to see what you do as your spinning skills develop! That is some mighty impressive beginner handspun. Lovely. Good Grief! I guess the shortest question is WHAT DON'T you do well!!!?? WTF---that is your beginner handspun? Mine looks like something a cat coughed up! I'm a bit of a lurker but I wanted to thank you for your lovely pictures, I'm on a (casual) quest to improve my snapshotting skills thanks to beautiful blogs like yours. Wow what great handspun. You're a natural! Enjoy the new toys, I see a wheel in your near future. Beautiful handspun. I'm also just starting to learn, but it doesn't look anything like that... Great job! And I LOVE! your Tomten Jacket! Haven't dared showing it to my bf yet cause I know he'll ask for one, and he's never asked me to knit anything for him! The handspun is fantastic! 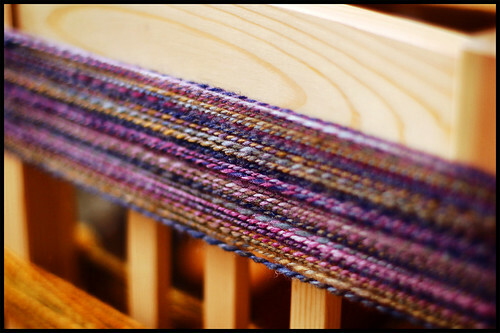 Do you have a project in mind for it, or are you just going to gaze at it skeined up for a while? Personally, I get the itch to knit so badly that I very rarely "set the spin." I cope with biasing. As another relatively new spinner, I highly recommend Pricilla Gibson-Roberts' "Spinning in the Old Way," in which, apart from offering helpful, illustrated techniques, PGR extols the virtues of top-whorl drop spindles. It's inspiring. alright, i have to stop lurking and comment now. i just saw the preview for the fall interweave knits . . . there was a pullover made of tweedy goodness - yours?